Peg Wood started playing music at age 5 when she began taking piano lessons. She hated piano then but is quite thankful now that she was given the opportunity and wishes she had been more open to the piano at the time. All she ever really wanted to play was the guitar, which she began learning at age 8. Luckily, the first guitar her parents got her was electric (as requested). Let there be rock!!! Since then, she also has played (not always well) keyboards, bass, trumpet, mandolin, banjo, baritone and harmonica. She played lead guitar in a number of bands in the 1980s in Illinois (her home state) and Iowa, including an all female pop punk band, Pop Smear with Laurie Haag and Laurie Dahlberg. She also did session and back-up work for Chicago Flying Fish/Rounder feminist singer-songwriter Kristin Lems. Peg moved to Seattle in 1990 and played in a number of bands until eventually helping to create Girl with 100 Heads (GW100H) with Mike Kuhn, Scott Wagar, and Mike Goodman (who was later replaced by Howard Parr). GW100H played in Seattle and the Northwest from 1993-1998 playing with such bands as Imperial Teen, Goodness, G Love and Special Sauce, Team Dresch, The Posies, Pansy Division and Super Deluxe. They were part of a group of bands at that time who were out and proud, many of whom would later be dubbed “altqueer” or “queercore”. GW100Hs had a great time playing The San Francisco Pride Festival in 1998. From 2000-2009 Peg played lead guitar for Ms.led, along with Lesli Wood, Matt Menovcik and Steph Hasselman. 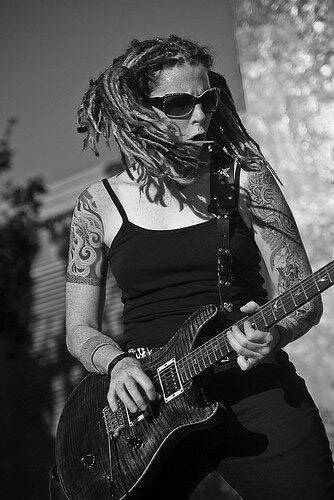 Ms.led played throughout the United States and in Sweden, playing with such artists as The Cliks, The Shondes, The Butchies, The Thermals, The Gossip, The Reputation, The Avengers, 50 Foot Wave and Team Gina. Ms.Led played a number of Ladyfests, Bumbershoot, The Reverb Festival, Bent Festival, SXSW, and Pride. Several of their recordings registered in the top 90 for KEXP in the years they were released. Peg played lead guitar for The Golden Greys with Mich Congdon, Darren Schoen and Daniel Davis from 2010-2011. She has been resting since then.